After 3 years in the planning, I can't believe our trip to Italy is over! Even more so, I can't believe how incredibly amazing it was. I tried to recap every day with notes on my iPad and grab a business card from the restaurants we dined at, so I guess we'll see how well I did with that. Here goes nothing! After a 9 hour flight with our TVs not working, we landed in Rome at 7:30am. Customs was really stressful - if you define stressful as the Customs agent not even looking at our Passports. We took the train from the airport to the train station in Rome, where we took another train to Florence - our home for the next five glorious days! After making the mile trek (with luggage), we arrived at our adorable bed & breakfast - Monte Oliveto. We had the whole place to ourselves and immediately loved the woman who ran it - Donatella. She was a little thing with bright red hair and the cutest clothes - all Italians are so effortlessly glamorous! The view from our bed.... I could get used to this! After settling in our rooms, we headed off for our first taste of Italian food at Trattoria Sabatina. It was here that we started our trend of being the only Americans in the restaurant (seriously, we were often the only Americans at the restaurants we visited, and I LOVED it!). I wasn't really paying attention when our waiter was explaining some of the dishes in broken English, and ordered Panzanella, basically a soggy bread and veggie salad. As can be expected (we're in Italy! ), it was so delicious and I would have never ordered it otherwise. So glad I did! Getting the trip off on the right foot - we also enjoyed a couple bottles of wine. 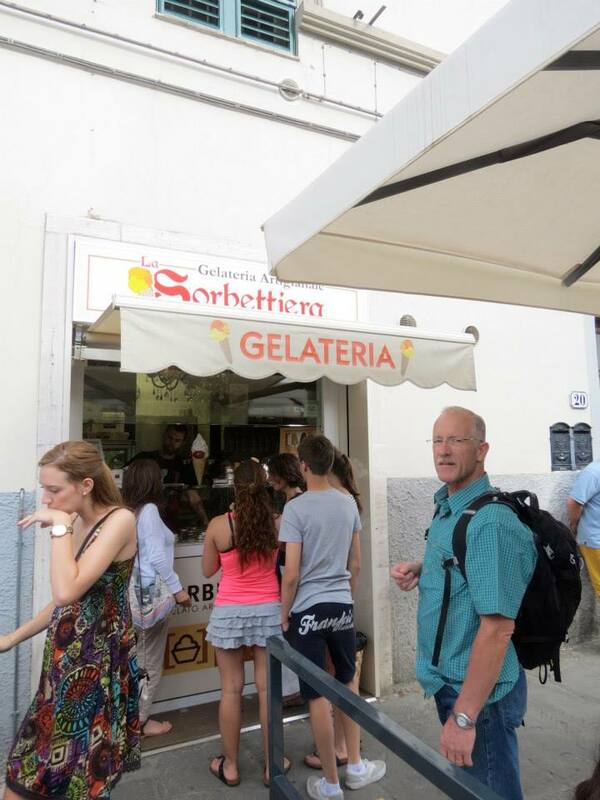 After a much needed post-lunch nap, we all experienced our first of many (many, many) cups of authentic Italian gelato at La Sorbettiera. 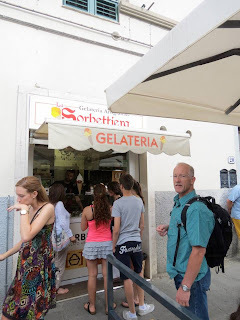 We had gelato at least once a day, but none really compared to this place. Donatella told us to steer clear from the "puffy" gelato in the display cases, as it's "puffy" due to a bunch of chemicals they pump into it. Even though it's not as pretty, make sure you get the flat kind. We spent the rest of the afternoon exploring Florence - crossed the Ponte Vecchio, watched a Ferrari Club whiz by us, admired how much the children and adults hang out outside without electronics, and decided on Alla Vecchia Bettola for dinner (another fabulous Donatella recommendation where we were the only Americans). We learned that Italians eat late - we arrived at 8pm, and the place didn't even start getting busy until 9pm. Another gelato and cannoli stop, and then everyone else went straight to bed. However, Adam and I bought a bottle of wine and enjoyed it on our fancy terrace at the B&B. I'm going to go ahead and say this was the longest day for Adam. He heard an alarm go off at 4am (he thought it was 5am because his watch had synced up wrong), and couldn't go back to sleep. So he went wandering through the streets of Florence, tasted his first of many shots of Espresso and then came back and hung out on the terrace. Dave is generally an early bird, so Adam decided to be romantic and throw rocks at this parents' window to see if they were awake. Guess what? They weren't. Once everyone else woke up about five hours later, we enjoyed our first breakfast at the B&B, and it was so delicious! It was the perfect amount of bread, pastries and fruit - nothing too heavy that would make us drowsy for the miles of walking we did each day. We were planning to go to Cinque Terre on Monday, so we decided to stop by a local travel agent and secure our train tickets. While waiting, we had the pleasure of watching an old man feed his toddler of a grandchild a cigarette to calm her down. That was a sight you don't see very often! The rest of the day was spent wandering around beautiful Florence. It was my favorite city of all we visited - I loved how relaxed it was, and the scenery didn't hurt! One thing I noticed about Italy is that even the most touristy spots are never very crowded. We started at Piazzale Michelangelo, where we got the best views of Florence. After that hike, we were all starving (and this girl was in need of a big glass of white wine). We randomly stumbled on a little pizza place that had the best pizza we had all trip. Highly recommend I'Pizzacchiere if you ever visit. Love this kid. We had so much fun together! After lunch, we visited the Accademia Gallery to see the Statue of David, and since we reserved tickets we only waited in line maybe 30 minutes, but once we were in I could have done cartwheels around David! It was never shoulder to shoulder anywhere we went (except for some parts of the Vatican Museum, but we'll get to that later). By the way, David was massive. I couldn't stop staring and wondering how in the world a 26 year old Michelangelo could pull something like that off in just two years. (Fun fact: I know Michelangelo was 26 because Kelsey and I were good students and sat through a 5 minute video on the history.) We also saw Il Duomo, which was also larger than life. How did people so long ago pull off such incredible architecture? 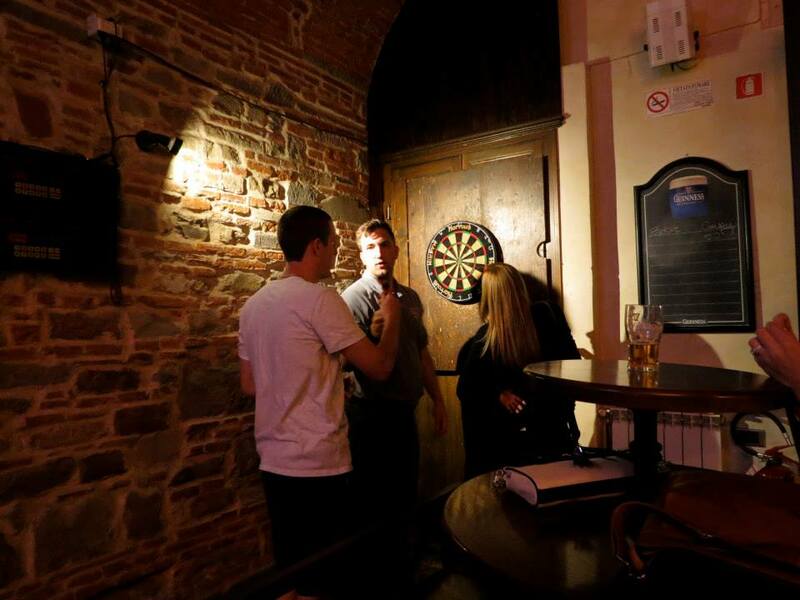 The night ended with us kids heading to a local pub and playing darts. Adam and Nathan even beat the locals! Must have been the limoncello shots they took. Excuse me, sir... can I come down there? Our first day trip was to Siena - about a 1.5 hour bus ride from Florence. After missing the first bus (we couldn't find the train station, then we had to wait in line for tickets, then the line was too long so we couldn't fit on the first train...), the second one pulled up minutes later and we were off! Siena is famous for their annual Palio race, which was occurring two days later on July 2 (thanks for the tip, Jason! I wish we could have gone!). The city is made up of 17 contrades, which have their own flags, mascots and chants. Out of those, nine compete in the Palio race. Although we didn't get to see the actual race, the festivities had already begun - we passed by various streets that were completely blocked off by particular contrades and all of the men were belting out these fun chants. It was very cool! One thing I love about all of Italy is that you can be walking down a busy road, turn down an alley way and be the only ones on the next street over. And you can also run into some pretty amazing views! Espresso fiend! Seriously, he would say he had to go to the bathroom and we'd pass him in a cafe taking a shot of espresso. The train back to Florence was a nightmare. You're not guaranteed a spot on the bus, so the line starts forming about 30 minutes prior to departure. We were second in line and by the time the bus got there the line was pretty long. The bus driver (totally on purpose) decided to stop the bus in the middle of the line, so it was a mad dash to get a seat. I lost just about all faith in humanity at that point! Nathan and I squeezed our way on and were able to save seats for the rest of the group, but unfortunately the family that was first in line were the only ones who didn't get a seat! It was very chaotic and I felt so bad for them. However, I happened to sit in front of an American couple and got to chatting with them about all they had done on their trip. 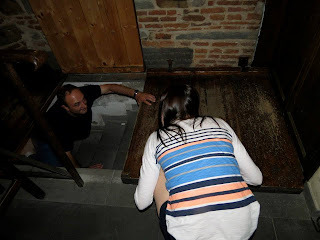 The day before, they did a wine tour in Tuscany and loved it. Turns out, we decided to follow in their footsteps on Wednesday. Once we got back to Florence, we grabbed some more wine and had our own happy hour on the front porch of the B&B (I'm sure there was also a nap in there somewhere). Dinner was on a lovely patio at a place called Napoleone. Per usual, the food was amazing and the wine was refreshing. Again, I'm sure we ended the night with more gelato, but they're all running together! You can get high quality safety equipment concept for the needs of your financing. These are available in various design, sizes and depending on your idea. We are cooperate with the customer and financial sector.